I’ve received so many email questions about why I’m interested in helping our fellow Americans on an island so far away that I thought perhaps sharing more info about what is going on there would help us all. Puerto Rico news is not common across the mainland – and I had to do some real searching to educate myself, including traveling there myself earlier this year! Thus I’ve collected a few recent pieces below from a wide variety of news sites if you’re interested in learning more. If you aren’t, that’s fine…tomorrow it’s back to crafting here on the blog, so I’ll see ya then! Here’s a piece about continued scarce access to potable water – this man is carrying only inches of water in that big jug because more would be too heavy. (I totally get that. Have you ever tried carrying 5 gallons of water?) Read more at WaPo. Here’s a story about a family that just got access to power in August – look at little Luana’s delight! The three kids have been without power for nearly a year. (Can you imagine 3 kids without power in today’s world? Yikes!) Read more at NYT. 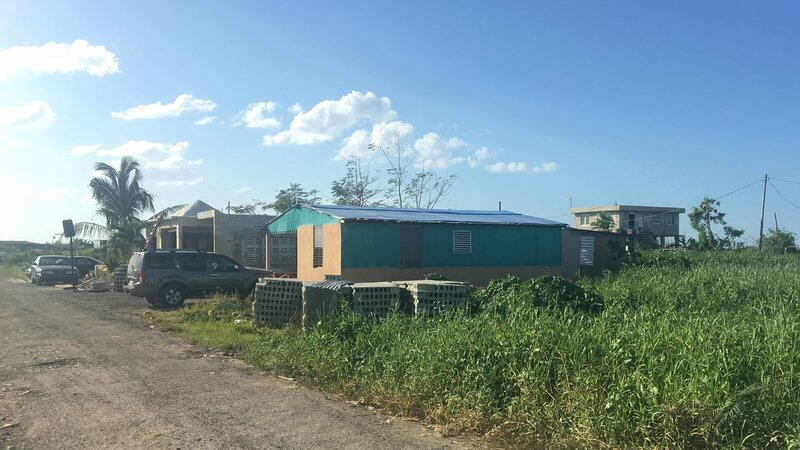 FEMA aid has been slow and in many cases unavailable – due to the way the island’s records are organized. Many houses are “informal” and have no titles or deeds, which FEMA requires. Often these families have lived in these homes for 50 years or more, but…they’re unable to rebuild. Read more at NPR. The government, for months, didn’t attribute deaths to the hurricane unless they were immediately affected by, perhaps falling debris or drowning. It’s often difficult/controversial to attribute deaths in disasters, but this one has been particularly frought. Thus, enters science: studies done in the year since the storm showed death tolls from 4645 (see Harvard study), to 2,975 (George Washington University study). Eventually Governor Rossello accepted the GWU results – showing that even the government looked at the methodology and accepted the findings. Read more at FOX News. That’s about it for now. Probably more than you bargained for, eh? I’ll be posting another reminder just before the auction ends….bid high! 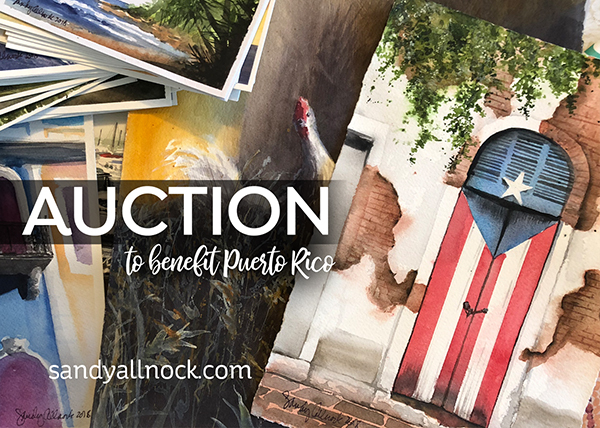 Your help means so much to Puerto Rico! Love your caring and generosity, and the fact that you educate yourself, first hand, on situations. There are so many in need of help. Sandy, are you still planning your trip to Puerto Rico in Feb 2019? Have you nailed down the specific dates and cost yet? I need to plan vacation time for next year soon and would like to attend your art class.